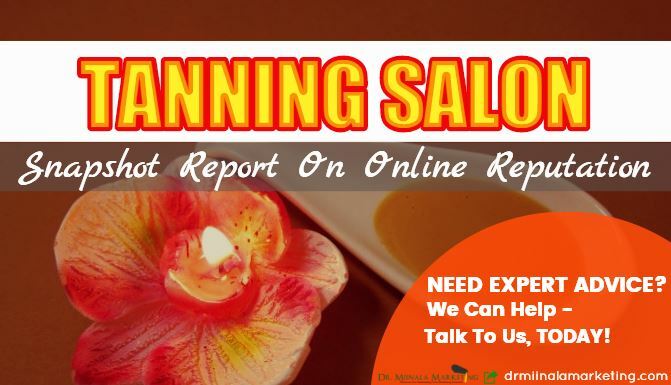 Dr. Miinala Marketing is now offering free snapshot reports on the online reputation of Tanning Salons. As can be seen on Dr. Miinala Marketing's Facebook page at https://www.facebook.com/drmiinalamarketing/, the company focuses specifically on providing people information on how to increase website traffic, often focusing on specific industries. The snapshot is designed to show how a tanning salon is faring when it comes to their reputation on the internet so that they can do something about it if it comes out to be less than stellar. A company spokesperson says: "Our goal is to make local marketing and online reputation building easier than ever. Different industries need to use different types of tactics to make sure things work for them, which is why our current focus is specific to tanning salon. We expect to be able to deliver similar services for other industries very shortly and will inform people about this on the website and Facebook page as soon as we can." The staff at Dr. Miinala Marketing are highly experienced in the field of digital marketing. As their LinkedIn profile at https://www.linkedin.com/company/dr--miinala-marketing demonstrates, they specialize in serving local businesses, especially tanning salons, in their online and mobile marketing needs. The marketing and advertising company were launched in 2015 and now has more than 10 employees in the team to provide the necessary support to clients. Dr. Marjukka Miinala, the founder and the owner, has authored a number of important articles and texts on online marketing. "Our goal is to make sure local businesses can become better known across the board," adds the spokesperson. "While our focus is mainly on tanning salon and attorneys, we are happy to work with any other local business as well. We believe that working with local companies is important, because of the tremendous impact it has on the overall economy as well. As such, we are all helping everybody out." While the snapshot report is designed specifically for Tanning Salon businesses, all businesses can access the free reports on local marketing. This is offered through Dr. Miinala Marketing's website on http://drmiinalamarketing.com/free-reports/. This report will show businesses what their current online standing is, and what they can do to improve on that. While the report is completely free and no obligation, they will be more than happy to work with clients to help them improve.